Each month Simon Says Stamp Challenge blog hosts a fun challenge called Anything Goes. It occurs on the last Wednesday of each month and you can enter just about anything that you create. So what are you waiting for? Join us! 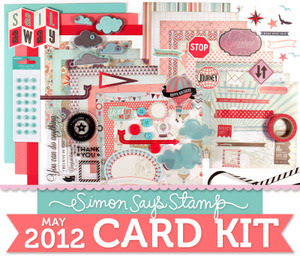 This week the Simon Says Stamp Challenge team is using stamps from Unity or Lawn Fawn. These stamps are not necessary for entering the challenge but if you have them we would love for you to play along with us. I used Unity's Itty Bitty stamp called Find The Joy. It was so easy to color with my Copics. If you are looking for a fast Christmas card stamp than you might want to check this one out. I also used Nestabilities Labels 18 to cut out the image. Then I used my little trick or tracing the outside of the edge of the Nestabilites on pattern paper and cutting it out by hand. That way I get a nice sized mat for the image which really makes the image standout! Then a couple of foam dots for dimension, a couple sheets of Echo Park Holly Jolly Christimas patterned paper and some Baker's twine from the Twinery and my card was finished. 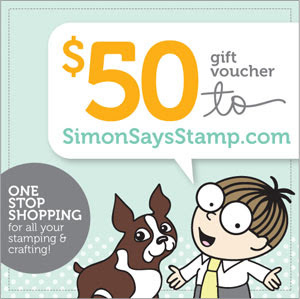 to the Simon Says Stamp online store!! That is a fantastic prize. I am sure that you could put quite a dent in your wish list with this prize! So get stamping and join us this week for Anything Goes!! Here is another card that I made with my Unity Stamps. I love how you can use these stamps with Copic markers or just patterned paper. This paper is a 6x6 pad from KaiserCraft. It included that fun bracket border shape. Just punch it out and adhere to your card. It's a great feature of their small paper pad. You might also notice that I used a Spellbinders die to create the background behind the ice cream cone! The fun thing about that die cut is that I finally got to try out the Copic Airbrush machine!! I've got a lot of testing and learning to do before I will feel comfortable with it but I was very happy with this piece. Thanks, as always, for stopping by. I always enjoy your visits and your comments. Be on the lookout for a class coming up on sewing on your layouts and cards at Scrapbook Mania. I've had so many requests for this type of class and I am so excited to be offering one in a couple of weeks. Call Scrapbook Mania at 205-424-4246 to reserve your spot. You will need to bring your sewing machine and manual. Wow, what a wonderful weekend filled with fun and friends for National Scrapbook Day. I want to announce the winners of my two giveaways. I really enjoyed your answers to both of my questions. I connected to so many of the comments and was glad to see that so many had fun plans for this weekend whether it was scrapbook related or not. Love, love, love the Jazmyne line!! I am going to a crop at my LSS with my BFF, we are planning on having a great time. Thanks for the chance to win!! Chris, please send me your snail mail address so that I can send out your package. Hey Christine - so good to see you yesterday! I like to scrapbook because I love to play with all of the fun paper and gadgets that go along with it and I love the way the finished product is something that I made myself!!! Mandy, please send me your snail mail address so that I can forward it to Nikki who will be sending out your prize soon. After a very busy weekend and after 2 baseball games today I finally got a chance to do a little crafting. I chose a couple of Unity Stamp challenges and I would like to share this one with you today. This challenge was to create something with birds or trees on it. You also had to use Unity Stamps. I thought that this Cosmo Cricket Nutmeg line was perfect for the card and I had a lot of fun stamping and cutting the tree and clouds to build my scene. Oh, just wanted to let you know that Nikki Sivils, Scrapbooker is having a Design Team call so jump on over to her blog to see the details. This mini album was created for Scrapbook Mania's Mar/Apr scrapbooking kit. I was so excited to use some of Pink Paislee's newest products. The pictures that I used were just ones that I pulled from my computer that were special to me for one reason or another. There is no time line, just random pictures from different times and places. I believe that I made do a couple more of these albums but make them contain a yearly snapshot. I love the album. It's easy to decorate and the 6x6 pages fit it perfectly so no cutting is involved. I thought that 365 degrees lines went really well with my alphabet stamps so I did most of my journaling with them. I have about 5 or 6 small sets. They are perfect for mini albums and cards. More stamps, and buttons and Maya Road chipboard tags. I also love making pockets and tags in my mini book. This is a fun Unity Stamp. I have used several of my Unity Stamps in the book. This particular one was perfect for a list. Life can be crazy so I included this page as a reminder to enjoy what I have, what I do, and what I love. I made this tag for each of the kits. It was really fun and simple. I used some great background stamps from Glitz and a shipping tag. The red dotted flower section was stamped with red ink on a piece of a shipping tag. I loved the effect it gave. It actually looks like real patterned paper. After I completed the book I went back to assemble the tags and for just a second started looking for that piece of patterned paper. Duh but cool. There is a fine line between need and want. The postcard is stamped on the Pink Paislee paper with another one of my background Unity Stamps. I love them. Another Unity Stamp and broke out the alphas again. Pictures are of my dd. These make me sad and happy all at the same time. Tim Holtz film strip ribbon. Wonderfully easy to use and it looks great! Where Dreamers Dream, Hearts Whisper Loudly. I don't know, maybe this is a quote that I heard or read before. All I know is that it popped into my head and I wrote it down. I love it! I had to put a pleated ribbon flower in there somewhere. I am really happy with how it turned out. This is the back of the canvas album. I took some of the left over ribbon and glued it to the spine and then added a page book mark. If you are interested in the next kit from Scrapbook Mania, 205-424-4246, you must call and put your name on the list. There will be just a limited number of kits available. All of this for just $24.99. If you live out of town we can mail one to you. Tomorrow I am heading to a baseball tournament but I hope to share a new layout I created. Throughout our lives will experience all sorts of turning points. Some we choose ourselves, others are chosen for us. Well, for me, today marks a turning point that both chosen by me and chosen by others. It doesn't really matter what that turning point is but only that it makes me happy. I will not be traveling as much as I have been in the last 6 months and, I and my family, are ready to get back to a more normal schedule. So in saying that I would like to share some information on 2 classes that I will be teaching this weekend in Perry, Georgia at the Paper Crafting Extravaganza. If you are going to the Expo, which you really should if you live in Georgia or the surrounding states, please think about taking my class. We will be creating some really fun projects. My card class is a little heavy on the technique side and my mini book class is just plain fun and adorable. I have been blessed to have two wonderful sponsors, Nikki Sivils, Scrapbooker and Simon Says Stamps. This class will be filled with a ton of techniques. You won't want to miss learning these "out of the box" techniques using stamps, ink, mist and embossing. This class is going to be so much fun. Lots of great paper and embellishments and very roomy pages. Look at those adorable little canvas covered buttons? So cute. Each of my classes will loaded with product and giveaways. We are truly going to have a rockin time. Please let me know in the comment section if you are planning on coming to one of my classes at the Expo and I will have a special giveaway for those participants that comment. I think I have finally found a school paper that I like. It's actually not school paper but Cosmo Cricket's The Boyfriend line, but it's got some very cool school themed papers in it. I think I like the red testing paper the best and that background paper is very cool. You can find these papers and more at Embellish Online. They also carry tons of American Crafts Thickers. Click on the link to go to the Embellish-Online store to see them all. I have used two different sets on this layout. The brown felt numbers and the yellow vinyl letters that spell "School". There is just something about that little bit of dimension of Thickers on a page that make me like them so much more than sticker letters. You might also noticed the stamping on this layout. The numbers in a row is a stamp block called Numbers from Unity Stamps. I love their stamps. They really have a wonderful unique selection. Just perfect for both scrapbookers and card makers. Do you also see the tiny little staple? That is from Tim Holtz's line and is called the Tiny Attacher. It is so cute and fun, you are sure to want one. World Card Making Day is almost upon us. I will be teaching a "Mystery" card class. I would love it if you could attend. Please email me for more information on time and place. Ahh, it's Friday so that means that I today I am going to share some Unity. Hip Hop was a lot of fun. I didn't get to participate that much because I was working but I was happy to enter my card this week in the two challenges posted. Luckily my card fit both challenges. The first one was to put something with wings on the card and the second was to create a card with NO ribbon. I just love this Cosmo Cricket paper, Early Bird, which you can get at Embellish Online. Don't forget to tell them I sent you and put in the code "Glitter" to receive 20% off your order. I thought it was the perfect backdrop for my feathered friend. If you are not sure what Hip Hop is you can get all of the info here. They are actually not going to do many more Hip Hops so if you want to participate now is your chance. On the Unity Splitcoast Company forum they have prizes and challenges and chit chat all day! The fun won't be going away though. They are just working on changing up Hip Hop to something new and different. Today is day 2. I am thrilled, scared, happy, sick to my stomach, and empowered. I am trying very hard to be a brave girl.